This morning I went on my walk up the hill, round the top and back. This is the walk that took me 80 minutes when I first went on it in April. I used to avoid it because it has the steepest route up the hill. Now it is my 60 minute walk. I did four jogging intervals this morning: 3.22, 1.15, 5.02 and 6.39 minutes! Over 5 minutes! And then a second time!!!!! At some point I noticed in that third interval that my breathing had smoothed from that gaspy ‘jogging’ breath to just in and out. And I started looking up. And it was no longer a case of I will just try and make it to *pick landmark*. But I was thinking I will just keep going until I stop. And in the fourth interval my breathing smoothed out again and I looked up and I stretched my legs a little more. And I was jogging. I can no longer say that I am trying to jog. I have to own up to being a jogger. – this morning, after my shower, I wrapped the towel around me and there was no gape! On Tuesday night my man cooked something new and it was really good. I thought I would share it here as what I cooked last night needs some more work. 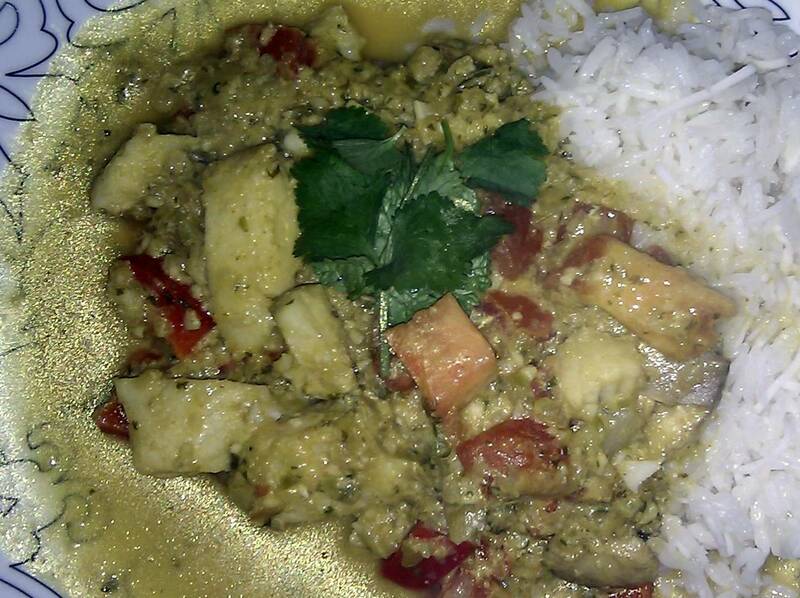 My man wanted to make a coconut fish curry. My one request was that he get light coconut milk. And the wonderful man checked the tins of coconut milk so he could get the brand with the least kilojoules. I really appreciated it. And looking at the recipe today and calculating the nutritional info, there can be a really big difference with the kilojoules in different brands of light coconut milk. It is worthwhile checking the lables for this item. Place all of the Curry Sauce Ingredients in a food processor or blender and process to form a smooth curry paste. Pour the sauce into a large frying pan or wok and place over medium heat. Bring to the boil. Add the fish, mushrooms and capsicum. Stir well, reduce heat so that the sauce is simmering gently. Cover and cook for 6 minutes. Add the tomato and gently stir in. Cover and simmer for a further 3 minutes. Adjust the seasoning – add more fish sauce instead of salt, add a little sugar if it is too sour, add lime or lemon juice if it is too salty or sweet. Serve the curry over rice, garnish with fresh coriander sprigs and the lemon or lime wedges.